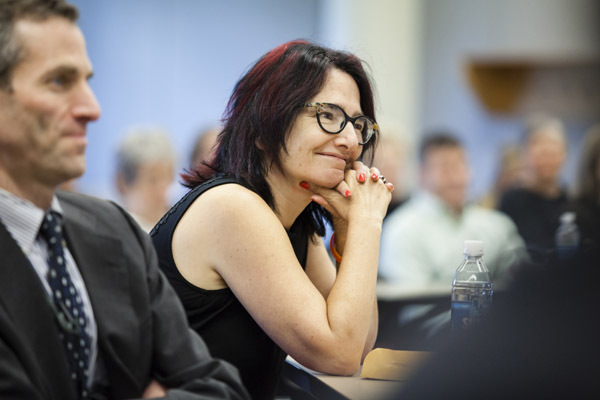 On Sept. 15, faculty, students, family and friends filled Keck Classroom to celebrate Erica Rand’s appointment as the Whitehouse Professor of Art and Visual Culture and of Women and Gender Studies. 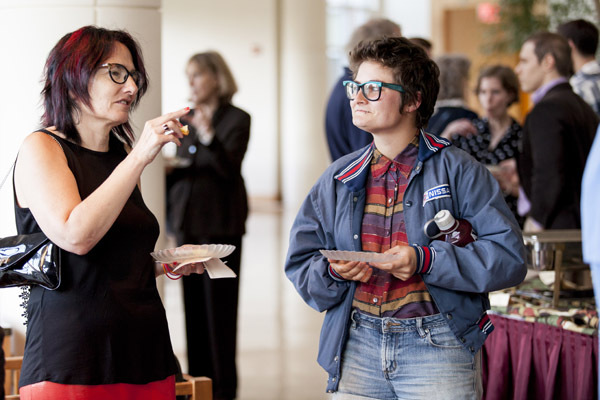 Rand marked the occasion with a talk, “Hips, Heft, and Fluff: Queer Experiments in Looking and Writing,” followed by a reception in Perry Atrium. In his introduction, Dean of the Faculty Matt Auer said Rand’s scholarship “explores the limits and possibilities of subversion,” often by elevating everyday phenomena, like Barbie dolls and figure skating, as worthy objects of analysis. Frank and at times revealing, Rand’s talk explored her approach to writing and analysis as a scholar, feminist and queer- and femme-identified woman. Her terms “heft” and “fluff” refer to gendered, raced and sexuality-related biases in academia about worthy topics, methods and practitioners of cultural work. During the question-and-answer portion, audience members probed further into Rand’s ideas, at times reflecting on their own relationships to writing and research. While not offering, by design, any easy answers, Rand’s talk demonstrated the core values of the Whitehouse Chair, which recognizes a dedication to educational and moral excellence and respect for human dignity. Rand was officially appointed to the chair in 2012, along with five colleagues also receiving endowed professorships. The Whitehouse Chair was established in 1985 with a gift to the endowment from David ’36 and Constance Whitehouse. Born and raised in Auburn, Maine, Whitehouse earned his M.B.A. from Harvard University after graduating from Bates in 1936. He served in leadership positions at the Container Corporation of America throughout his entire career, retiring in 1980 as vice president. The Whitehouses passed away in the spring of 2000 and are survived by four adult children.